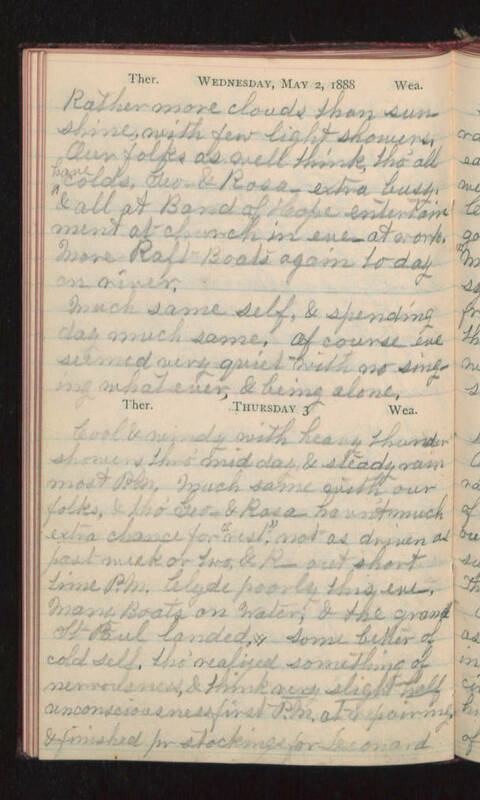 Wednesday, May 2, 1888 Rather more clouds than sunshine, with few light showers. Our folks as well think, tho' all have colds, Geo- & Rosa- extra busy, & all at Band of Hope entertainment at church in eve- at work. More Raft Boats again today on river. Much same self, & spending day much same, of course eve seemed very quiet with no singing whatever, & being alone. Thursday 3 Cool & windy with heavy thundershowers thro' midday & steady rain most P.M. Much same with our folks & tho' Geo- & Rosa- havn't much extra chance for "rest", not as driven as past week or two, & R- out short time P.M. Clyde poorly this eve. Many Boats on water, & the grand St Paul landed. Some better of cold self, tho' realized something of nervousness, & think very slight half unconsciousness first P.M. at repairing, & finished pr stockings for Leonard.